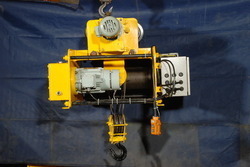 Pioneers in the industry, we offer electric wire rope hoist and mini electric hoist from India. We are among the leading organizations, engaged in manufacturing, supplying and exporting a premium quality range of Electric Wire Rope Hoist. Manufactured using optimum quality raw material and advanced techniques, our products are widely acknowledged by the clients. We strictly adhere towards the quality policy to ensure clients that our products are in conformation with the set industrial standards. Clients can avail these products from us at reasonable prices.